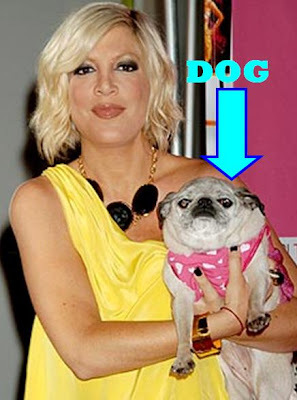 Donna Martin’s dog, Mimi LaRue (which I believe is Latin for “Impulse Purchase”) is currently sipping French Vanilla Iced Coffees in hell right now with Satan. First Tim Russert and now this? Hasn’t the American public suffered enough loss for one week? Uh, Mimi probably waited until you signed on the dotted line for your role as Donna Martin, again, in the new 90210 spinoff. I mean, I know that’s what I’m waiting for before I meet Jesus. My thoughts, prayers, and old sneakers go out to the Spelling family in their time of need. As a side note, Andrea Zuckerman was unsuccessfully reached for comment. Now's Your Chance, Ray! Donna Martin and Tori Spelling Set to Fix the New 90210! Tori Spelling FINALLY Back on 90210! Get Ready for Those Stairs, Donna!